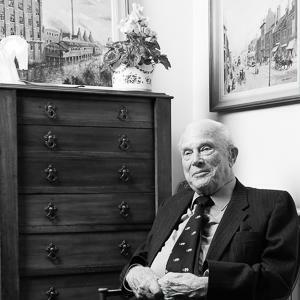 John Holbrook Osborn was born on 14 December 1922 in Sheffield. He was educated at Rugby School and Trinity Hall, Cambridge, and served in the war in West Africa. He married three times: Molly Suzanne in 1952; Joan Mary MacDermot in 1976; and Patricia Hine in 1989. Osborn worked in the family business. Chairman of Hillsborough Divisional Young Conservative and Liberal Association from 1949 to 1953, he became Conservative MP for Sheffield Hallam in 1959 and held the seat until 1987. He served as Parliamentary Private Secretary to the Secretary of State for Commonwealth Relations and for the Colonies from 1963 to 1964. From 1975 to 1979 he was a Member of the European Parliament. During his time as an MP he was a member of several Select Committees, including Science and Technology and Education, Science and Arts. He was knighted in 1983, and retired from Parliament in 1987. John Osborn died on 2 December, 2015. Click here to listen to the full interview with John Osborn in the British Library. My decision to retire from Parliament? Oh, my Constituency Association had enough of me. Roland Jenkings, before me, didn’t get the support of the Association and I didn’t get the support of the Association. I could have fought my Association and stood with their candidate as an independent and I might have gone back to Parliament on that basis. But I got advised to give up politics while the going is good. It’s no good being a Member of Parliament if your constituency is against you. Some people tried that, but usually burned their fingers and I was able to revert to old interests and old recreations. I played much more golf, much more tennis. And I retired properly. Track 1 [42:34][Session One: 5 December 2012] Sir John Holbrook Osborn (JHO) born Sheffield 14 December 1922. Describes father [Samuel Eric Osborn]’s work as Director of Samuel Osborn & Co ltd. Mentions working as a Director of the company before and after time in Parliament. Describes being born in Sheffield and growing up in the Peak District [Fulwood, Sheffield]. Mentions attending a preparatory school in Fulwood [Miss Naylor’s School at Ashdell, Sheffield] and a boys’ school in Sheffield [Birkdale School aka Griffiths’] before being sent to board at Rugby School. Mentions having little choice over choice over schooling. Mentions continued connection to Birkdale. [05:42] Describes activities of Rugby’s Local Defence Volunteers [LDV – ‘Home Guard’] at the outbreak of the Second World War. Mentions being active in LDV. Describes impact of the War on the city of Sheffield. Mentions being in Sheffield during an air raid. Describes ordering an attack on an enemy aircraft. Mentions running a special foundry engaged in war work. [10:22] Describes volunteering to the Royal Corps of Signals. Mentions being spurred to join up due to a rejection of pacifism. Describes travelling through West Africa. Mentions feeling part of Britain’s colonial forces. [13:37] Mentions joining the Young Conservatives as soon as he left Rugby. Mentions not feeling as though the War had impacted upon his political outlook. [15:41] Describes time at Trinity Hall, Cambridge. Mentions serving in Armoured Division of Cambridge University Officer Training Corps and being spurred to serve in military due to a rejection of pacifism. [18:03] Describes undertaking a management trainee course at the National Foundry College in Wednesbury. Mentions serving an apprenticeship with a Birmingham firm. Describes pioneering a new technique of precision casting. [22:33] Mentions being focused on industrial career but learning to speak politically as a Young Conservative. Describes political landscape in Sheffield. Mentions that the context provided a good basis for later travails. [26:43] Mentions never setting out to become a Member of Parliament. Describes being asked to stand as a candidate in Hallam following the retirement of Sir Roland Jennings [RJ]. Mentions a belief that the seat was unwinnable. Describes addressing local meetings. Mentions having very little contact with RJ. Mentions gaining support and help from the Conservative Party. Description of involvement in previous election. Mentions being helped by local benefactors. [33:19] Description of campaign during 1959 General Election. Mentions expecting to be elected. Mentions helping the Conservative Party’s campaign in other constituencies. Mentions canvassing with local party members. [38:57] Mentions feeling a sense of ‘pleasurable duty’ to other members of the Conservative Party. Describes involvement in elections after 1959. Mentions feeling that he was fighting for others and not himself. Track 2 [41:17][cont. from Track 1 42:34] Describes entering the House of Commons as a Member for the first time. Mentions being shown around the House by Peter Emery [Conservative MP for Reading]. Mentions attending a meeting for new Conservative MPs. Mentions serving on committees and speaking in the Chamber. Anecdote about those MPs who devote attention to speaking in the Chamber. [04:55] Description of Maiden Speech. Mentions the reaction from other MPs and reflection that it was quite controversial. [07:33] Describes daily activities as an MP. Mentions serving on Parliamentary and Party committees. [10:37] Briefly mentions relationship with constituency. Describes working as PPS to Duncan Sandys in Commonwealth Relations Office. Mentions travelling on Commonwealth Relations and industrial business. Mentions returning to West Africa. [14:06] Describes hoping to pursue the interests of industry through Parliamentary work. Describes travelling widely on industrial and Parliamentary business. [16:08] Describes accepting Parliamentary life as it stood. Reflects on the difficulties of balancing constituency, Parliamentary and industrial work. Mentions holding constituency surgeries and seeking to build up local Conservatives. Mentions facing a conflict of interest between committee work in House of Commons and dealing with local issues. [20:50] Describes being given full support by family. Mentions that JHO’s maternal grandfather was a Conservative MP [Colonel Sir Arthur Holbrook]. Describes role as a Non-Executive Director of Samuel Osborn & co. [22:47] Mentions constituency feeling that JHO was spending too much time on international travel. Mentions that the constituency was becoming a marginal seat. Describes work as a Member of the European Parliament, Member of the Council of Europe and Member of the Western European Union. Mentions being willing to travel and being chosen to undertake such work because of past experience. [29:25] Describes relationship with Conservative Party and Whip’s Office. Mentions that the party felt that JHO was a suitable candidate for overseas work. Reflects on not having ambitions for high office. Mentions being able to pursue interests under both Edward Heath and Margaret Thatcher’s leadership. [34:03] Describes decision to retire. Mentions not getting the support of constituency party. Mentions contemplating standing as an Independent but deciding to retire properly. Mentions not having wanted to become a MP. Mentions not regretting decision to retire. [38:31] Reflections on career as an MP. Mentions not feeling ‘good enough’ to have done the job any better. Concluding comment about not having provided successor [Irvine Patnick] with advice.